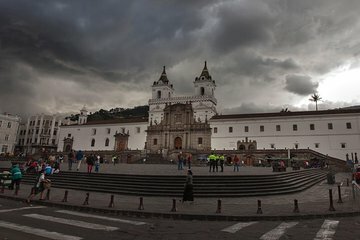 Genießen Sie eine Kostprobe der natürlichen, kulturellen und historischen Sehenswürdigkeiten rund um Quito während dieser umfassenden Tagestour. Genießen Sie den herrlichen Blick auf die Hügel von Panecillo Hill und San Juan Mirador. 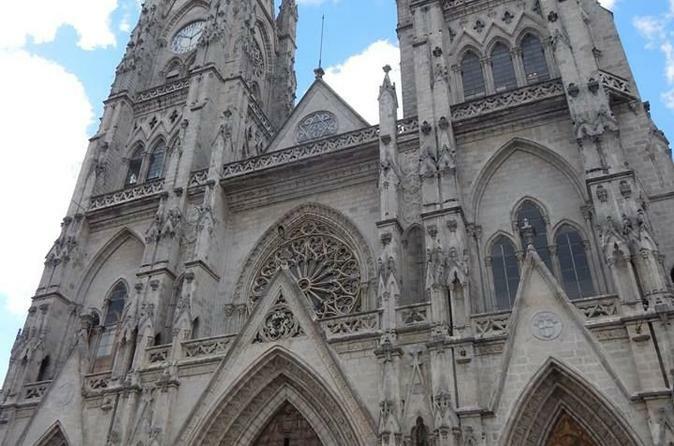 Sie werden auch das historische Stadtzentrum von Quito erkunden, indem Sie mehrere Kirchen und Gebäude aus der Kolonialzeit besuchen. Nach dem Mittagessen erleben Sie das Leben auf beiden Seiten des Äquators der Erde im Monument der Mitte der Welt, bevor Sie Ihren Tag mit der atemberaubenden Landschaft des Pululahua Geobotanical Reserve beenden. Ihre umfassende Quito-Reise beinhaltet auch einen Reiseführer, einige Eintrittsgelder für die Website und ein optionales Upgrade für eine private Tour. Our tour was excellent! Our tour guide was absolutely wonderful and informative. She even got us in a certain area to see the Old Town from above. Love the equator tour as well. Excellent tour. Great guide. Highly recommend. We had this with Latin Adventures. Alfonso, our tour guide, drove me and my wife a private tour to places like the Quito Virgin, and the Cathedrals in downtown Quito. Since this happened on a Sunday, the Feast of Three Kings in Catholic church, we were able to catch a parade that showcased the richness of the Ecuadorian culture. A visit to the real Mitad del Mundo highlighted our trip. It was a perfect day to have this tour. Amazing trip! This is NOT our first Viator all day tour. However this was our first time in South America. We booked this particular tour because it had everything we wanted, as well as the flexibility of a personal guide and schedule. We we not dissapointed! Our guide Francisco picked us up at our hotel in the heart of the old city early, and we packed the day full including some off tour goodies, like visiting the Olga Fisch shop and museum, and having an excellent lunch while on the way there. He spent all day with us, and dropped us that evening at our next hotel near the airport, as we had a flight out the next morning to the Galapagos. Francisco found us some wonderful vantage points of the old city from some rooftops we NEVER would have found on our own! Really appreciated this service, and the ability to book reliable and high quality tours ahead of time from anywhere in the world is truly wonderful. This tour was amazing! We got to see many exciting sights and my tour guide personalized part of the tour for us so everyone got to visit the areas of Quito that they wanted to see. It was over and beyond my expectations. Felt rushed the whole day. Weren't taken into the Middle of the World Monument had to take pictures from outside although we went into the official site next door. Was told we had to pay an extra 50 US because of the location of our hotel and we weren't told until we were already driving back to the hotel at the end of the day. What choice did we have at that point? None. We would have been better off just taking a taxi to the monument and later to central Quito, and going at our own pace throughout the day. We had a wonderful time on this tour and Daniel was an excellent guide! the differences from one side of the equator to the next. their USA 1-800 number to get a local contact in Ecuador. BUT - all worked out perfectly!! Amazing tour, great guide, a highlight of our stay in Ecuador! Amazing private tour. Santiago was our guide and we saw a bit of everything. We also got to go on the cable car to a beautiful lookout. We switched around the tour a bit since we had already seen a good amount of old town Quito. Our guide was fun, attentive, and the sights we saw were amazing. It was nice doing a private tour so we could go where we wanted, eat what we wanted, and see what we wanted. I recommend it.